This year is the 50th anniversary of manned spaced flight. The Soviet Union won the Space Race with the United States when on April 12, 1961 the Soviet Union spaceship, Vostok 1, carried Yuri Gagarin into orbit around the Earth. 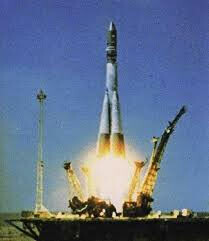 Vostok 1 was flown in automatic mode as it orbited the Earth for 108 minutes. Gagarin ejected from the spacecraft 4+ miles above the Earth and landed by parachute in the Soviet Union. The successful flight was celebrated throughout the world when it was announced, except by the United States that would have to settle for second in space in a few weeks. 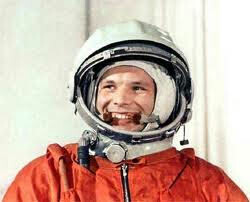 Gagarin, a former M-15 pilot, was only 26 years old when he entered the Cosmonaut training program in 1960. He was selected to be the first Cosmonaut because of his superior performance in the program and because his height of 5’2” made him a better fit for the small Vostok capsule. The national hero toured the world but returned to work in the Space Program. After the fatal crash of Soyuz I, Colonel Gagarin was grounded from the space program for his safety. He continued flying, however, and in 1968 died in a plane crash at the age of 34. The hero’s ashes were buried in walls of the Kremlin in Red Square in Moscow. He was survived by his wife and two daughters.